The M-Audio BX5 D3 is the latest addition to the M-Audio BX family and the most powerful model to date. Optimized for a smooth and natural listening experience, these speakers are perfect for professionals, beginners, and everyone in between. This guide discusses some of the popular questions about the BX5 D3 features and functionality. What is the difference between the BX5 D3 and previous BX models? What are the size and dimensions of the BX5 D3? Do I need a separate power amplifier for the BX5 D3? What is the Max Peak SPL of the BX5 D3? Can I use both inputs at the same time? How do I connect the speakers to my computer? Where do I put the speakers so they sound the best? Should the speakers be mounted on anything or can I place them on my desk? Where should I set the Acoustic Space switch? Is it ok to leave the speakers powered on? Should I power on the BX5 D3 before or after my other gear? Where should I set the volume knob? What material are the woofer and tweeter made of? The BX5 D3 speakers are more powerful than the previous BX speaker models, featuring 100W of Class A/B bi-amped analog power. This means they're capable of louder volumes with less distortion, so you get an accurate response at any volume. 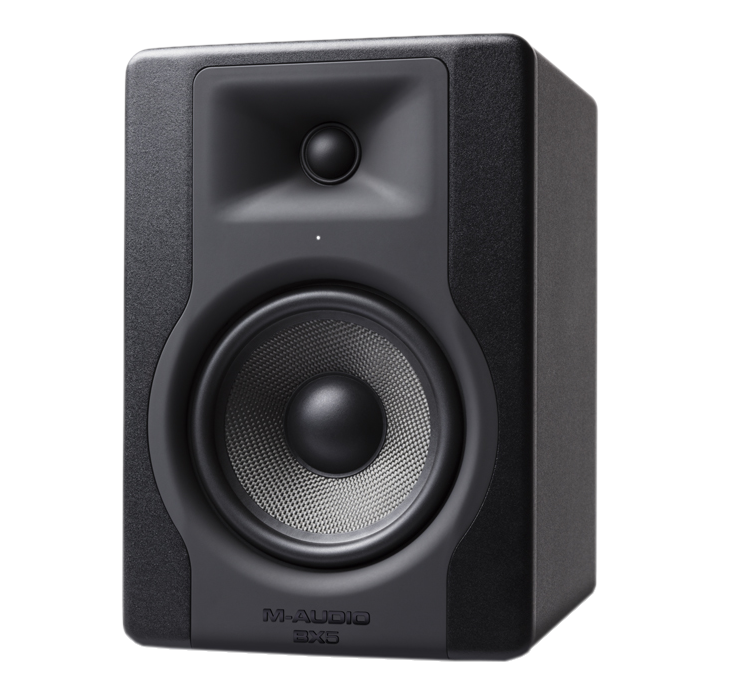 10" x 6.9" x 7.8"
The M-Audio BX5 D3 monitors are "active" meaning they have a built-in amplifier. They should be connected to a line level source such as an audio interface or mixer, and the volume of the speaker can be set accordingly using the volume knob on the back. The Max Peak SPL is measured in decibels and rates how loud the speaker can go before distorting. The BX5 D3 has a Max Peak SPL rating of 110 dB SPL. While you can connect a different source to each input (XLR and TRS), we do not recommend using both sources simultaneously. This will degrade the quality of your audio signal. We recommend placing a mixer in your signal chain to mix signals from different sources before sending the signal to the BX5 D3. For the best results, the speakers should be connected to a USB audio interface, mixer, or high-quality sound card with balanced outputs, using balanced TRS or XLR cables. If necessary, the speakers could be connected to the headphone output on your laptop or other device using a stereo 1/8" (3.5mm) to dual 1/4" TS cable. Keep the cable shorter to prevent picking up any noise or interference from the environment. Please make sure that the speakers are turned off before connecting or disconnecting any cables. Imagine that the two speakers and the listener make up an equilateral triangle, meaning that both speakers and the listener are the same distance from one another. In a normal listening environment, the top of the woofer should be level with the listener's ears and the speakers should be angled at 60 degrees pointed towards the listener. To help with this, the BX5 D3 features a pinhole power LED. When the speakers are arranged properly, the LEDs will appear the brightest from the listening position, indicating the "sweet spot" or the position with the best stereo image. Avoid placing the speakers directly against a wall or other solid objects. This will prevent air flow which can affect speaker performance, as well as cause a build up in certain frequencies which can negatively color the sound of your signal. We recommend at least one foot from any wall or other large surfaces if possible. A distance of 3 feet or more will allow for the optimal low-frequency response. Consider the 38% guideline. This suggests that the best position for the listener is 38% of the way into the room, measured from the wall behind the speakers. Once you find the listening position, the speakers can be arranged to match. This article goes more in depth. Consider removing objects in the room that may cause unwanted reflections that color the sound, such as mirrors, glass or metal. Acoustic padding and other treatment can help in these scenarios. This article goes more in depth. The BX5 D3 monitors are great for placing right on your desk and come with an optional foam isolation pad to help reduce sympathetic vibrations from the desk and vice versa, keeping the signal clean and clear. This switch will compensate for low-frequency build-up when the speakers are placed near a wall or other large surface by attenuating the signal at 85Hz. The switch can be set to Flat (no attenuation), -2dB and -4dB, and should be set according to the sound of the speakers in that environment. The speakers should be powered off when not in use. Please make sure to power off the speakers before disconnecting or powering off any connected gear. Follow the reverse order to shut down the system, powering the monitors off first. This process will prevent unwanted pops and noise through the speakers when powering on your gear and can help preserve the lifespan of the speakers. This will depend on your environment and the audio source, but in general, it's best to avoid extremes. For example, avoid turning the monitors up all the way and then keeping your computer, interface or mixer volume low. This may bring unwanted noise into the signal chain and decrease the dynamic range. Try setting the BX5 D3 volume to around 50%-75% and adjust the output volume of your source accordingly. The BX5 D3 features a 5" woven Kevlar® woofer and a 1" Silk dome tweeter.